Corollary: Some humans are superior to others. Thus, those that think they are fit (Leftist Elites) have the right to decide what is best for everyone else. Three news stories in the last week indicate the stronghold that Eugenics has in the United States. Before getting into the stories, it would be worthwhile to define eugenics for those of you with public school or inferior private school educations. Given Darwin’s belief is almost universally accepted as true—except for those of us that are Orthodox Christians—it should be no surprise that folks believe that some men are superior to others. The sad part is that people that should know better have fallen for this anti-biblical lie from hell. This has been a purposeful deception. The irony, the survey sponsor said, is that Planned Parenthood founder Margaret Sanger was an advocate of eugenics and promoted birth control among black communities. Overall, 41 percent favored tax subsidies, and 39 percent oppose them. But among blacks, 53 percent favor the subsidies, and only 20 percent oppose them. The history of Sanger and her advocacy for birth control in black communities is well-documented. “Her views and those of her peers in the movement contributed to compulsory sterilization laws in 30 U.S. states that resulted in more than 60,000 sterilizations of vulnerable people, including people she considered ‘feeble-minded,’ ‘idiots’ and ‘morons,’” Grossu found. Grossu noted that even now, nearly 80 percent of Planned Parenthood’s surgical abortion facilities are located within walking distance of black or Hispanic communities. And she pointed to figures from the Centers for Disease Control and Prevention from 2007 to 2010 showing that more than one third of all abortions destroyed unborn black babies. That’s even though black Americans make up only 13 percent of the population. What I believe with little empirical doubt is that the New York Legislature has just legalized conscious fetal murder on a potentially very large scale, WITHOUT competent medical supervision. The latter point strongly suggests that they don’t want to hear the truth from highly qualified MD’s. The measure, which Gov. Andrew M. Cuomo quickly signed into law Tuesday night, was pushed through by Democrats who now control both legislative houses. The Senate passed it 38-24. In the Assembly, it passed by a 92-47 margin. In the face of calls at the federal level to weaken abortion rights, the bill maintains abortions as legal within 24 weeks of the start of a pregnancy – “or at any time when necessary to protect a woman’s life or health.’’ Late-term abortions had previously been authorized under state law if they meant saving the life of a woman. Per US Supreme Court case Doe v Bolton, health of mother was defined as mental health which has been interpreted as convenience. If mother doesn’t want baby then she doesn’t have to give birth to the child because this could cause undue mental and/or physical strain on her. This case was released same day as Roe v Wade in 1973 and was coupled with Roe to allow abortion on demand. The New York bill expands abortion availability. Virginia Democrat Kathy Tran’s bill would allow abortion even when mother is about to give birth for mental health reasons. Going ever further, Virginia Governor, Ralph Northam, while defending Tran’s bill, advocated killing the baby even after birth. Those familiar with so called bioethicist, Peter Singer, would not be surprised at such comments. For decades, Singer has advocated subjecting newborn children to a battery of tests to decide if a child should be declared “human’ otherwise they can be killed up to age two years without any repercussions. 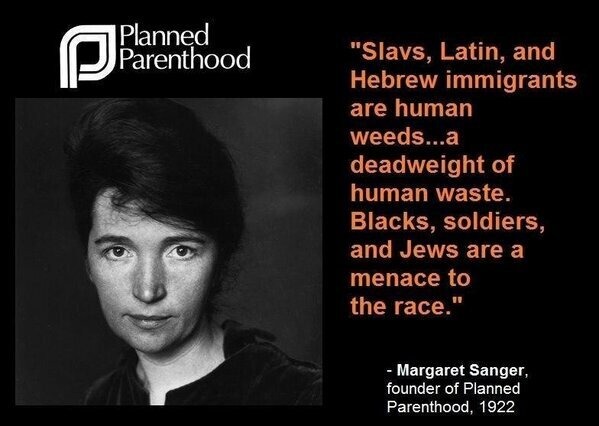 Eugenics is an integral part of the ideology of the Democrat Party. Sadly, many that are the targets of extermination are happy to support those that want to exterminate them. Democrats act on the basis of your skin color not the content of your character. This is the reason they use identity politics. They want to limit and control people. Their promise of security in exchange for yielding liberty is false.